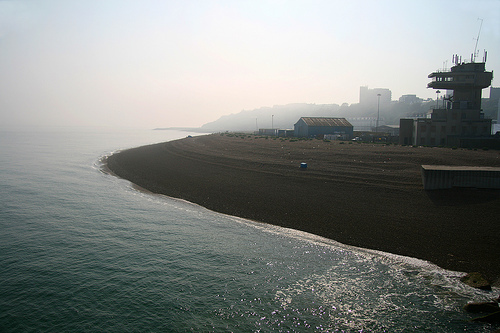 The Rotunda beach is the beach that fronts Folkestone to the west of Folkestone pier and its formation is thanks to the pier which acts as a barrier to collect shingle from nearby Sandgate, Seabrook and Hythe which is pushed by the west to east tidal drift. Over recent years the shingle has grown extensively, whilst to the west of the beach recent coastal defence work has reinforced the Rotunda’s shingle as well as providing shelter and a number of outcrops for anglers to fish from. A favourite venue amongst the local anglers it is extensively a rocky ground venue, short range accurate casting finds sand amongst the many rock and weed reefs, but tackle loss is inevitable. Best fished low water up and at night, in summer it is a holiday beach, the strong tide at high water makes long range fishing difficult with a cast of 30 yards often enough. In winter cod and codling are the main species, whilst dogfish and pouting are around for most of the year. During the summer it is an excellent bass venue, especially over the low water when a fresh mackerel fillet or head has accounted for lots of specimens during that first hour of the flood tide. The odd conger also shows, whilst other species include wrasse and to the eastern end close to the pier wall where the bottom is sandy dabs, plaice and sole are occasionally landed. Most anglers fish the venue with a single hook bait for the larger cod and bass and for most of the year a large peeler crab bait on a 3/0 Pennell Pulley rig is the most practical. When crab is in season it is the best bait for the spring codling run on the venue. Lugworm and squid occasionally accounts for fish, but such baits are not as effective as peeler crab and are often removed very quickly by the local crab population. Bass can be caught on lures throughout the length of the venue and from the rock groynes at the western end with the Trace Ace, bass bullet one of the best lures, it was originally proved and tested on this venue. Walking the beach with a lure during the flood tide being a recognised tactic. Harbour Tackle, 10 Beach St, Folkestone Harbour, Folkestone, CT20 1QW, tel: 01303 220763. Opening times: 8am – 4pm Monday to Saturday. 8am – 1pm Sunday. Bait: Lug, rag plus frozen baits. 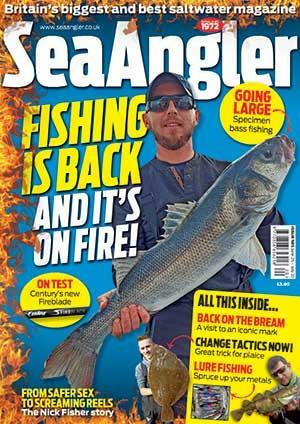 Folkestone Angling, 12 Tontine Street, Folkestone, CT20 1JU, tel: 01303 253881. Opening times: 8am – 5.30pm Monday to Saturday. 8am – 12pm Sunday. Den's Tackle, Dymchurch Road, Hythe, CT21 6JN, tel: 01303 267053. Opening times: 7am to 6pm Monday – Saturday. 7am to 2pm Sunday. Bait: Black lug, frozen bait. Mick's Tackle, 1 Thirlestane Terrace, Dymchurch Rd, Hythe, CT21 6LB, tel: 01303 266334. Opening times: 8.30am to 6pm. Open seven days. Bait: All fresh baits, including yellowtail and black lug. Bait to order. Number of lakes/pegs : . Directions : Head for Folkestone on the M20 and then follow signs for Folkestone Town Centre and Harbour. There is plenty of free and pay as you go parking along the beach front between Folkestone pier and the Sandgate Country Park.